In reference to the safety of genetically modified crops, I hope by now you have heard of the results of the research team from the University of Caen that were published yesterday September 19th, 2012 reporting that rats fed a lifelong diet of a common strain of genetically modified corn developed breast tumours and severe damage to their liver and kidneys. 1. 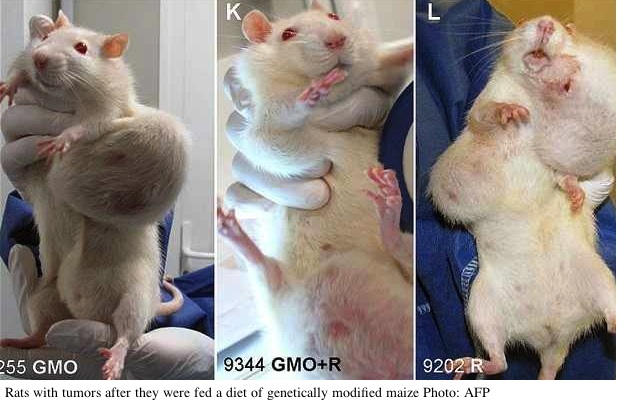 Do you believe you have a duty to reveal the University of Caen research findings that GM corn caused tumors in rats to those who depend on your expertise about the safety of GM crop consumption? 2. If your answer to #1 is affirmative, then do you believe that it was prudent for the French ministers to ask their National Agency for Health Safety (ANSES) to investigate the finding? 3. If your answer to #2 is affirmative as well, do you concur with those of us who believe that you have a duty and an obligation to the nations/agencies/individuals or anyone in consultation with you in reference to the safety of GM crops to provide them with not only the results and conclusion of the GM food safety research done last year for 90 days, but also these ones done over a 2 year period? 4. Do you believe that on your Website front page next to your slogan “Transforming Agriculture for improved livelihoods”, you should also post something to the effect – “Warning – while we may advise you on using GM crops; Research has shown that Rats fed on GM crops over a long period have developed Cancer” or “The French government has launched an inquiry into the safety of genetically modified crops after a study suggested GM maize could cause cancer in rats”? 5. Do you believe that by not revealing the results and conclusion of GM crop safety done over a 2 year period, you are knowingly participating in information concealment or with holding and could later be liable for information concealment or with holding if and when there are damages resulting from GM crop consumption by your clients or those who may have taken your expertise advice indirectly through your clients? p/s: Ever heard of Tobacco lawsuits for information concealment? Dr. Lala Aime Razafinjara, could you please pass on this e-mail to Dr. Jacques Mbonigaba Director General – Rwanda, whose e-mail was not listed; thank you. This one looks really scaring, i missed reading it! Unfortunately, it is even gets worse with new research findings.